The Seahorse Restaurant is a Michelin star rated restaurant situated along the River Dart. Run by Mitch Tonks and Mat Prowse, this team is passionate about and specialises in serving seafood of the highest calibre. As it is their 10th anniversary this year, Mitch and Mat have invited celebrity chef Rick Stein to be a guest chef at the restaurant as a celebration of their accomplishment. With this celebration has also come a new menu and kitchen refit, extending their possibilities of splendid edible presentations to their guests. Dartmouth is known as the ideal Devon seaside tourist destination, for stressed travellers from other parts of the country. The warmth of this eatery in Dartmouth welcomes guests into an unassumingly relaxed and comfortable atmosphere. The style is that of class and grandeur. And although highly elegant, there is nothing pretentious about this spot. They have a charcoal-roasted option too which includes 400g of Sand Sole cooked whole with lemon and olive oil. Their high-quality produce is mixed with the finest ingredients to ensure a stunning experience regardless of what you choose from their crafted menu. The Seahorse’s menu is that of personal depth and community. Among the options are celebratory specials, such as the current one for their 10th birthday, a full course menu of endless possibilities, and even a local’s menu with a three-course meal for £20. This variety and attention to each individual patron translate their dedication to the seafood dining industry. When added to their cozy yet sophisticated approach to fine dining, their dishes are beyond satisfying. With many acclaimed seafood restaurants in the Great Britain region, patrons often might have trouble choosing. 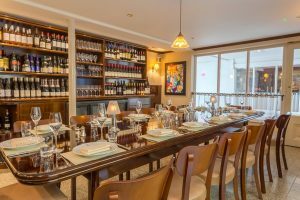 But when it comes to The Seahorse Restaurant, anyone with a craving for good food, excellent service and an atmosphere to suit it will be blown away. With such an esteemed reputation, it is one of the finest places to dine in England.